Weddings in Mangalore are often synonymous with tag ‘The Great Indian Wedding’ as there is as much shoo-shaa around it due to the presence of all weddingy features such as a whole band of relatives – uncles, aunts, cousins and friends who attend it, amazing spread of food, music and dance, grand clothes, jewellery & other wedding finery. Much like their North Indian counterparts, Mangalorean weddings especially Catholic style weddings are highly celebrated occasions. We have the Roce function which is similar to the Mehendi or the Haldi ceremony and involves the ‘purification & preparation’ of the bride and the groom for the sacred nuptial ceremony. This is done by way of application of freshly extracted coconut milk by the close family members of the bride and the groom in their respective homes. Since the coconut tree is considered to be the ‘kalpvriksh’ (divine tree that fulfills wishes) in India especially in South India, this local tradition has woven itself with the pre-wedding ceremony as well. The coconut tree and its many medicinal and other practical uses has given it the significance and importance that it richly deserves and hence besides being known for the great wonders it can do to one’s skin, the coconut milk is considered to be the most pure form of cleansing. Today’s recipe is traditionally served on the wedding day as it is considered to be ‘rich’ or ‘fit for a banquet’. 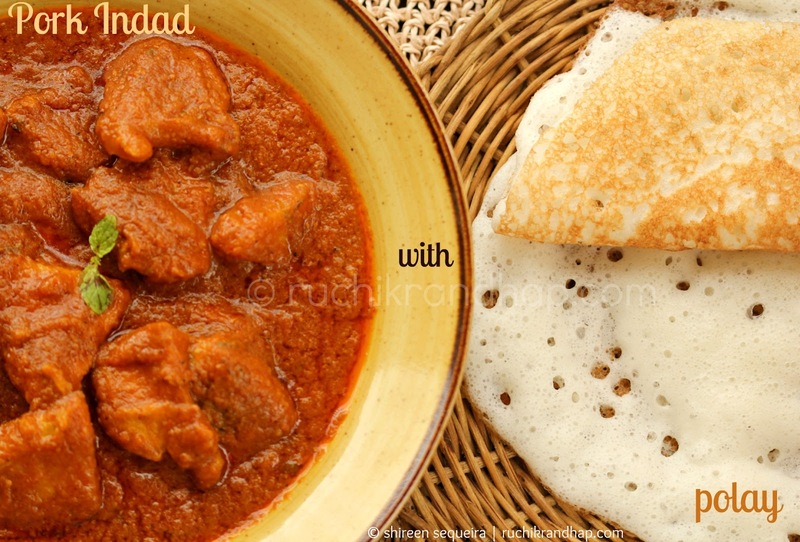 Owing to its Portuguese influence on Mangalorean and Goan food, this dish is prepared in both the places with slight variations – so the recipes will vary. 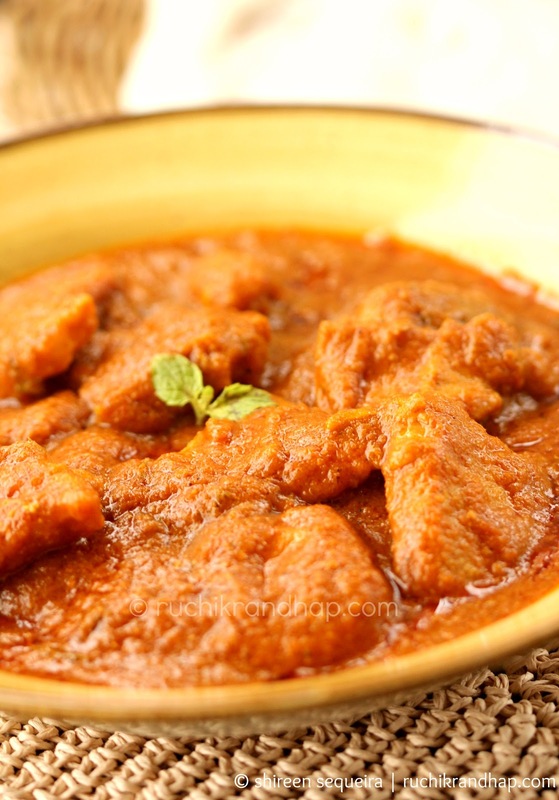 The signature flavour of this dish is a blend of sweet and sour married to spice – no single flavour dominating the other, yet creating a medley of flavours bite after bite. Not just the meat, but even the bits of fat are a joy to savour. Since it has been ages since I attended a typical Mangalorean Catholic wedding, I am not sure if it is still considered good enough to share space on the wedding banquet menu, but when I was little, it was one of the items that was served alongside Sanna, Sweet Pulao & Plum Chutney, Tendli Sukhe, Chicken Curry and Mutton Biryani. A cucumber salad completed the spread and people wolfed it down with great pleasure. Two decades ago, you were actually happy to savour a wedding meal. Not so much today as everyone cooks these delicacies at home plus during the wedding season you have a million weddings to attend that you actually dread the spread! Most people I know have simple meals at home and attend the drill (wedding if you please) just because attendance is important. Honestly, I could give anything to actually attend one of these weddings where the food is good. A good wedding spread in Mangalore doesn’t come cheap (but the per plate price is not as ridiculous as it is in the cities either) and if the caterer is willing, he will suggest a few off beat dishes that is bound to leave your guests licking their fingers. However, nothing can beat the traditionally cooked banquets that held the hands of Mangalorean weddings for decades before weddings became a large affair and outsourcing the food to wedding caterers became the need of the hour. Just in case you are wondering what I am blabbering about – well, maybe my parents’ generation was the last to have tea parties for their weddings. Right after the nuptials the wedding entourage assembled in the party hall, usually the church hall and everyone was served a hot cuppa and some biscuits. And our grand parents’ generation was the lucky enough to partake of wedding banquets held at the bride’s home with meals lovingly cooked by relatives and friends especially from the neighbourhood. Each family (from the neighbourhood) was given the responsibility of preparing one dish in bulk and pork was supplied by one of the neighbours. One well fed pig was enough to feed everyone. On the wedding day the guests were served whilst seated in rows on mandhryo (thin long carpets woven out of reed) and eating out of shirothyo (banana leaves). The beauty and charm of such traditional weddings and banquets has faded long ago, what remains are the delicacies – I hope they don’t vanish completely from the wedding menu of our next generation. 1. Wash and drain the pork and cut into thin slices (i.e 1-1/2 inch squares along with the fat on each piece). Boil/cook the meat without covering the pan until all the water has evaporated * see note#1. Heat ghee/oil in a pan and fry these pieces on a medium flame till golden and the fat leaves the sides of the pan. 3. Add the ground masala and continue to fry for about 8-10 minutes on a slow flame. Add the reserved masala water if you require more gravy. Finally add the cinnamon, cloves, mint leaves, sugar, vinegar & salt. Allow to simmer for another 5-7 minutes. 1. Unlike other recipes where the masala is fried first and then the meat is added, this recipe calls for the frying of the pork first for that extra rich flavour and then the masala is fried along with the meat. So cook the meat uncovered and then fry it. Pork tends to leave a lot of water when cooked, so we need to remove all the excess water by evaporation first. The more you fry the meat on a slow flame, the tastier the end result. Just ensure that the frying takes place on a slow fire and the meat is not burnt. 2. The reserved masala water is used only if you need extra gravy. Indad is meant to have a thick gravy so that it can be eaten with Indian breads such as Neer Dosa, Sanna, Appam or Dosa. If you wish to eat it with rice, then go ahead and add the reserved water. 3. If you desire you may add peeled & sliced potatoes just before adding the ground masala. 4. Indad is meant to have thickish gravy with a fine balance of sweet, sour & spice – adjust all these elements according to your taste. These are grouped with the pork, but you have forgotten to write what is to be done with them! Please check step# 3. I have not forgotten but clearly mentioned where and when to add the cinnamon, cloves, mint, sugar, vinegar & salt. Hope this clarifies! Hi Shireen, one recipe that I have been waiting for long and couldn't wait to test on the day it was posted. We introduced it at our restaurant on 11th and repeating it today Sunday with Sweet Pulav and Apams. Thanks a million. It has come out awesome. We reduced the peppercorns in our second attempt. Great going. Keep up the good work. God Bless you. Hi Steven, Wow! That sounds wonderful!! 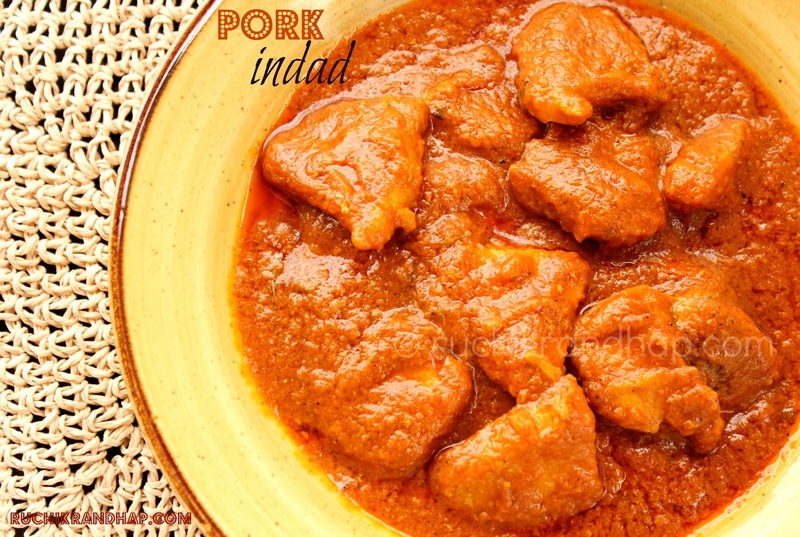 I am so happy that the Pork Indad came out good and it's already on your restaurant menu!! My husband is mighty pleased with the results too!! Thanks a lot for the prompt feedback!! Delicious gravy..The color is spot on!! Rich & inviting… Must try this out with eggs..
Great recipe Shireen! My husband said it was the best pork curry he has had :). 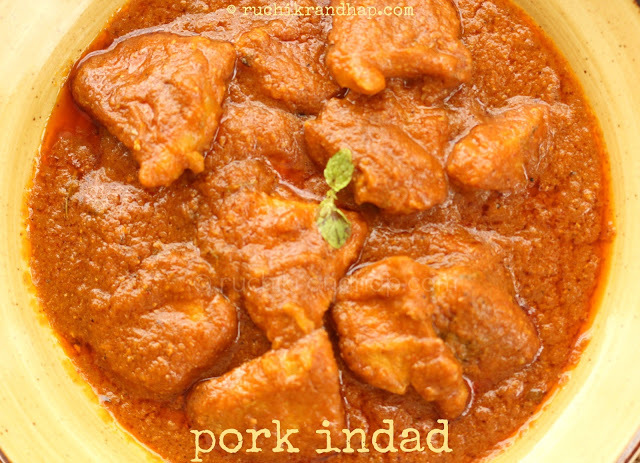 Thanks a ton for the recipe,looks delicious and sounds yummy too and I want give it a try,but just a quick question,Can I use chicken instead of pork,because I vaguely remember my mum making chicken Indad in a similar way.Let me know your thoughts. Hi Preema, thanks so much for your lovely comment. Yes, you could try the same recipe for Chicken Indad as well, however the process of frying will be much shorter as chicken is a tender meat. I suggest you fry the masala first and then add the chicken and allow it to cook. Pork takes longer to cook and hence the increased timing for frying. The masala can be the same. Tried it for New year and it was Yum!!! Thanks for the recipe! @ Smiles: Thanks so much for your feedback 🙂 glad you enjoyed it! Thank you Sandy, hope you like it! I made this dish last night! turned out 10/10! Thank u! @ Lavina: Thanks for the feedback! Glad to know that you enjoyed it! @ Anonymous: Thanks so much for the feedback! I feel honoured when I receive messages such as yours 🙂 do stay tuned for more recipes!